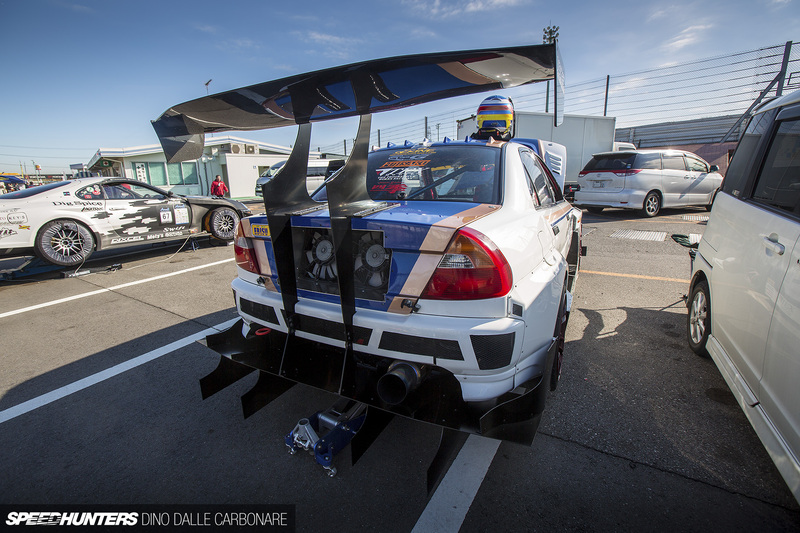 It’s that something a little unique or a little out of the norm that I hunt for every time I’m at Tsukuba Circuit. 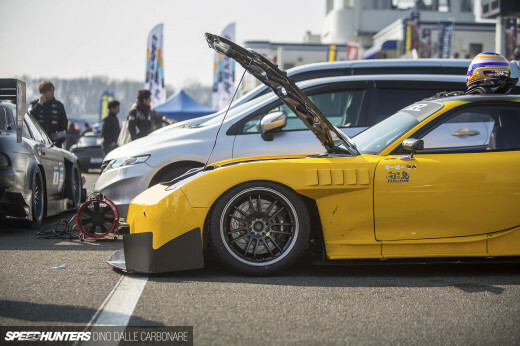 And it’s especially at events like last weekend’s Attack, which open the door to time attack amateurs and high profile teams alike, that you see people really striving to try out new ideas and interesting solutions. Had the hood on this Mitsubishi Lancer Evolution V been closed, I probably would have glanced at it and kept walking, but I’m glad that wasn’t the case. Even before getting right in front of it I was questioning in my head why anyone would ever want to put an intercooler in this position in an Evo. I immediately talked to the owner who was sitting right next to his car and asked: “is that some sort of charge cooler arrangement?” His reply was no; it’s a regular air-to-air intercooler mounted in this position so that the pipework could be ultra-short for the crispest throttle response possible. It’s hard to say if it would be advantageous or not, as I’d assume heat soak would be a big negative factor without a dedicated shroud, but that’s where the integrated water sprayer comes into action, further lowering temps. Plus, without an intercooler or a radiator up front there is quite a big flow of air moving through the engine bay and out through the hood vents. I can’t say I’ve seen many Evos with a rear-mounted radiator, that’s for sure! Much of the work on the car has been handled by Tex Modify up in Ibaraki, a shop that’s been around for decades, first specializing in street/drag builds, and later preparing drift machines like Tanaka’s Team Orange S15 and Impreza. 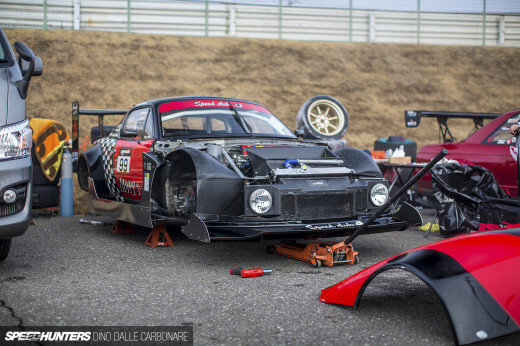 The interior is fully stripped out, and modified for racing in a very Japanese way with the bolted-in Cusco roll-cage and a custom dashboard dotted with more gauges, modules and gadgets than a astronaut would know what to do with. But then again, it’s one man’s approach to prepping his car for serious circuit work, and its uniqueness is what makes it so special. 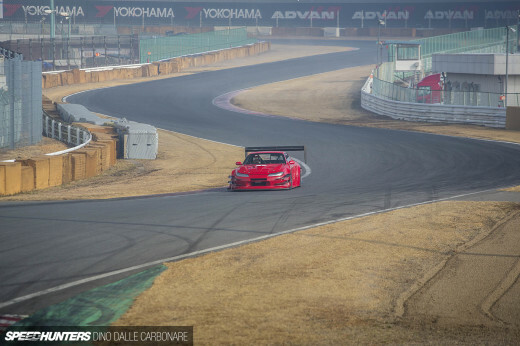 The Evo managed a fastest lap of 1-minute flat at Attack, and while that might not be as quick as the times we’ve become used to hearing about, it’s definitely a serious result. Big thumbs up to the owner and his outside-of-the-box way of thinking! They look like Rays Gramlights 57xtremes. Not certain though. my guess would be from underneath the car. Impressive!!! It's definitely heavy modifications. To be honest, that is original smart creative idea putting a rear-mounted radiator to work on the trunk. There's a few in the UK! Shortest cold side plumbing, longest exhaust manifold? Yup the turbo was indeed moved way forward. Surely there might be trade offs with doing that!